Plywood tender tank....a Purinton trademark! All parts can be handled on a 9" lathe, benchtop milling machine, and drill press. 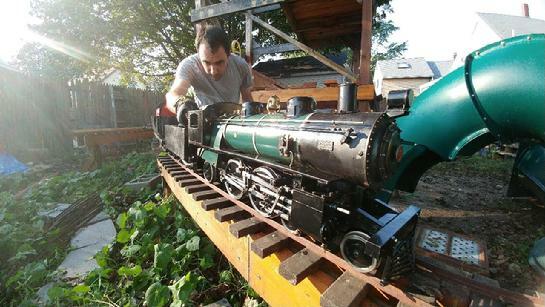 Charlie built his Angus with just the lathe and the drill press! The castings for "Angus". Made in New England, USA. All castings are from original Purinton patterns except the smokebox front and door; these are by H.J. Coventry. The complete set of castings as shown is $895 plus $32 shipping to the USA. Pricing includes a construction book of Charlie's drawings that completely details all parts. For other countries, please inquire. 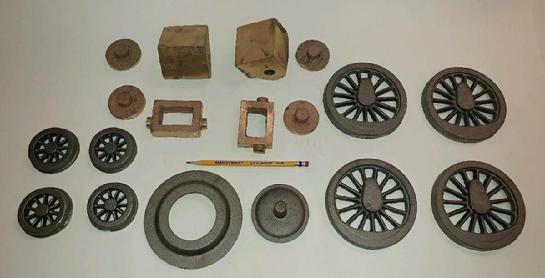 Please note: The smokebox front and door castings shown above, are by H.J. Coventry. Charlie Purinton used to specify that VanBrocklin smokebox fronts be used, but they are not available at this time. The domes can be fabricated, or, H.J. Coventry domes for the 0-6-0 switcher can be used. The "Angus" owned by Jay Monty (shown in the video above and the photo below), uses the H.J. Coventry domes. Please inquire if you'd like to purchase these domes for your Angus. 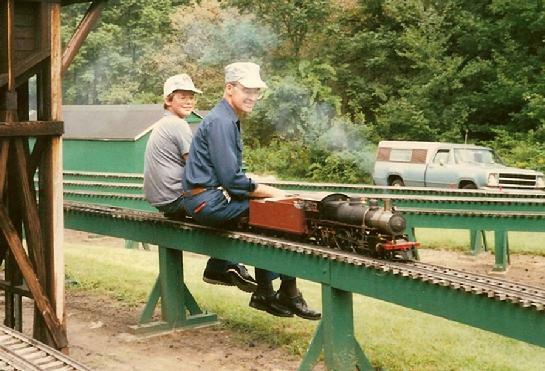 Bob Hornsby and John Kurdzionak ride behind Charlie Purinton's original Pennsy E5, the design from which "Angus" was developed. Waushakum Live Steamers, 1986.